I love the look of blanket ladders. I think they add a cozy feel to the room and make guests feel warm and welcome. What I don’t love, is the prices on store bought blanket ladders. It blows my mind that stores can charge $50 and more for a few pieces of wood screwed together. 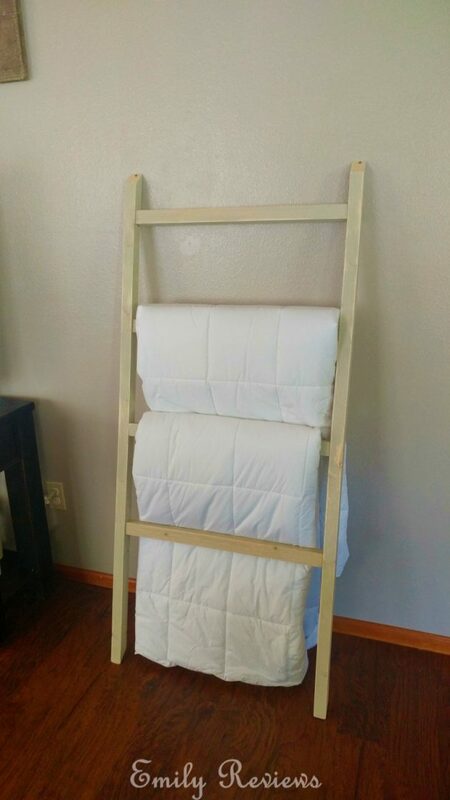 After searching the internet high and low for deals and coming up empty handed, I decided to just make a blanket ladder myself. 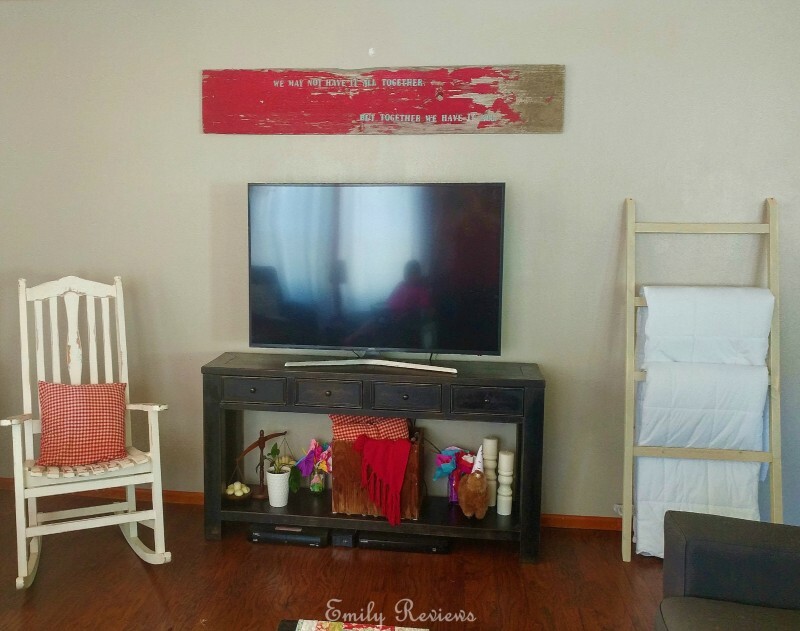 We have a few family members who have recently demoed projects in their homes. We were given the wood. I went out to our lumber pile and found a few 1x1s. I thought they were the best option for my blanket ladder. I had specific blankets that I wanted to place on my blanket ladder. I folded the blankets and measured the width of them. This helped me determine how wide I wanted my blanket ladder. 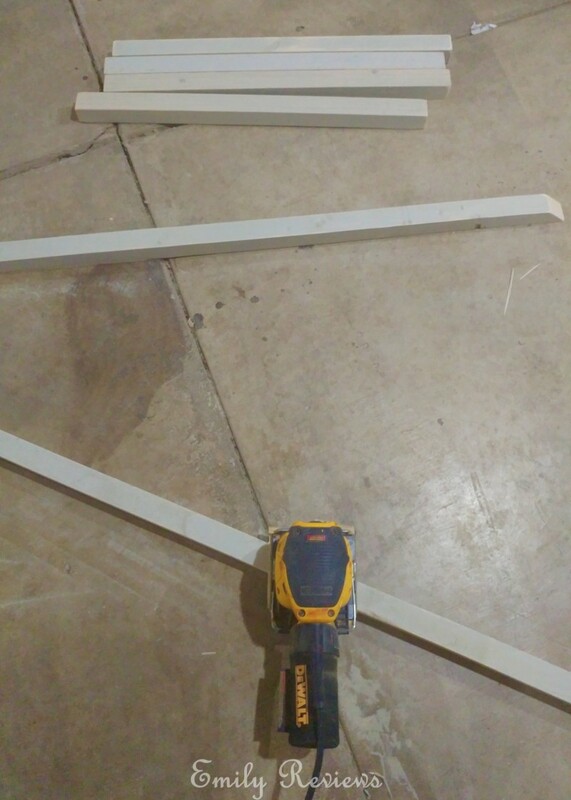 I decided to cut my ladder “steps” twenty-four inches long. I wanted a top step, bottom step and a step for each of the two blankets. Next, I needed to figure out how tall I wanted my ladder. I decided to make my ladder five feet tall. 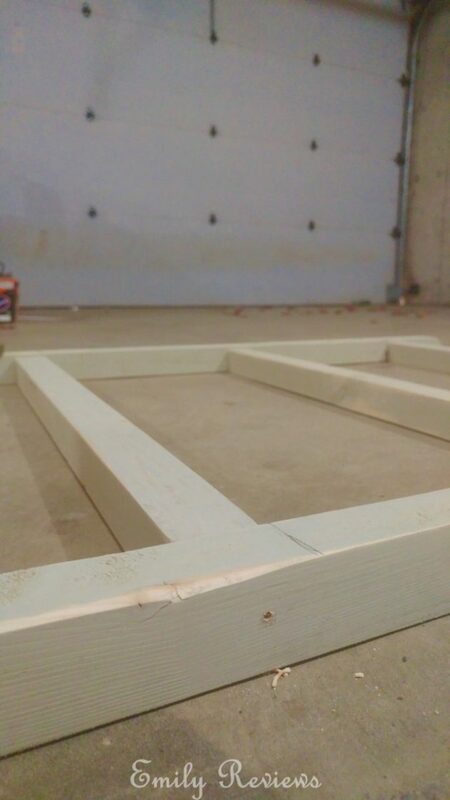 I cut the 1x1s to length and then used the miter saw to cut forty-five-degree angles on the ends of the boards. This would allow the ladder to lean against the wall better. I cut the top angles in the opposite direction so that I would have a spot to screw the ladder to my wall for support. Now that all of my pieces had been cut. I used sixty grit sandpaper to sand off any rough spots. 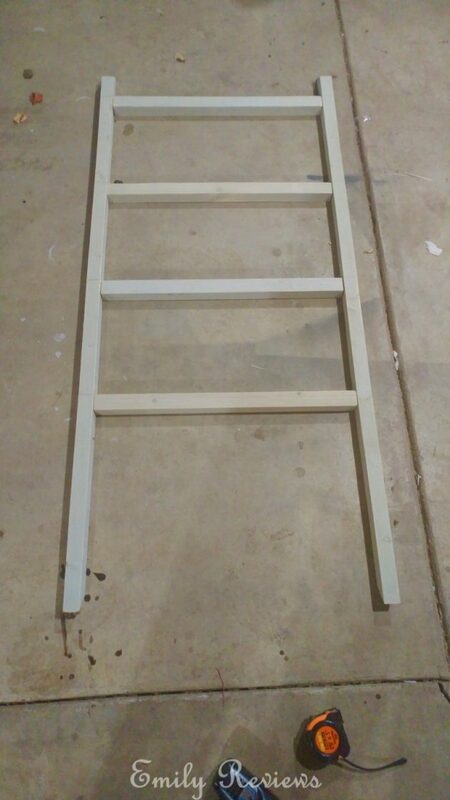 I wanted my ladder to have a used look. So I used the sander to distress it a bit. If you want your ladder painted or stained, now is when you would do that. 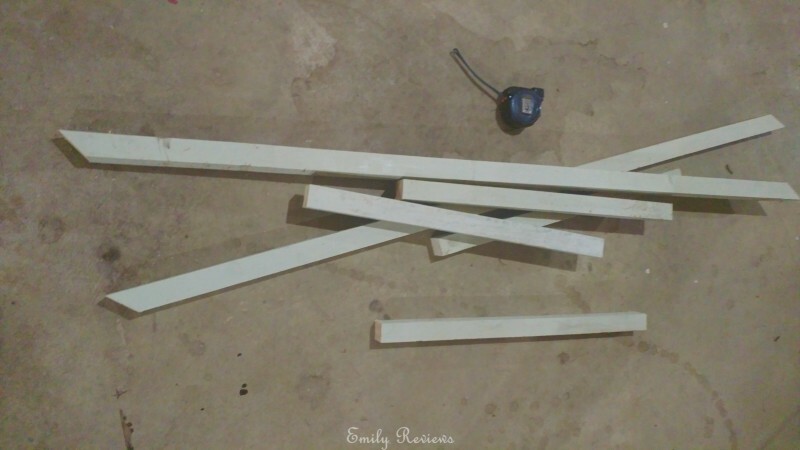 After that, I laid out all of my wood pieces on the floor in a ladder shape. I knew I wanted the blankets to hang on the middle two steps of my ladder. The bottom step was going to be used for tucking the blankets behind. The top step I wanted to leave empty. Someday I may add some decor to this step but, for now, I just wanted it to be open. I played with the step spacing until I got the look I wanted. My top step is three inches from the top of the ladder sides. I set it in place drilled holes and screwed the ends together. I used two-inch screws for the job. 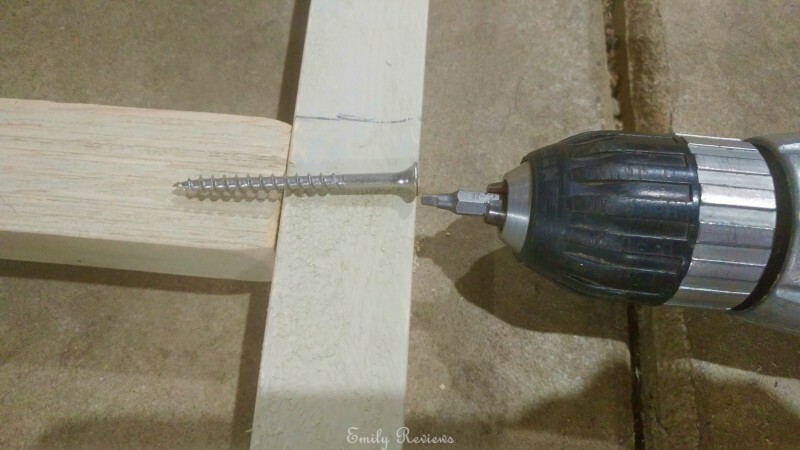 This would allow the screw to go all the way through the outside 1×1 and approximately another inch into the ladder step. Once that top step was secured, I drilled and screwed the remaining three steps twelve inches apart. 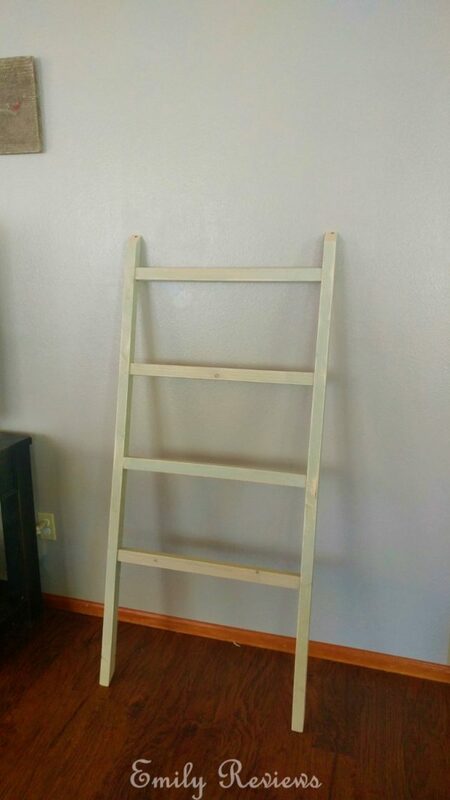 When the ladder was done being constructed, I again used my palm sander and sixty grit sandpaper to add a little more “wear and tear” on the ladder. To finish it off, I used a damp towel to wipe off any remaining dust. There you have it. 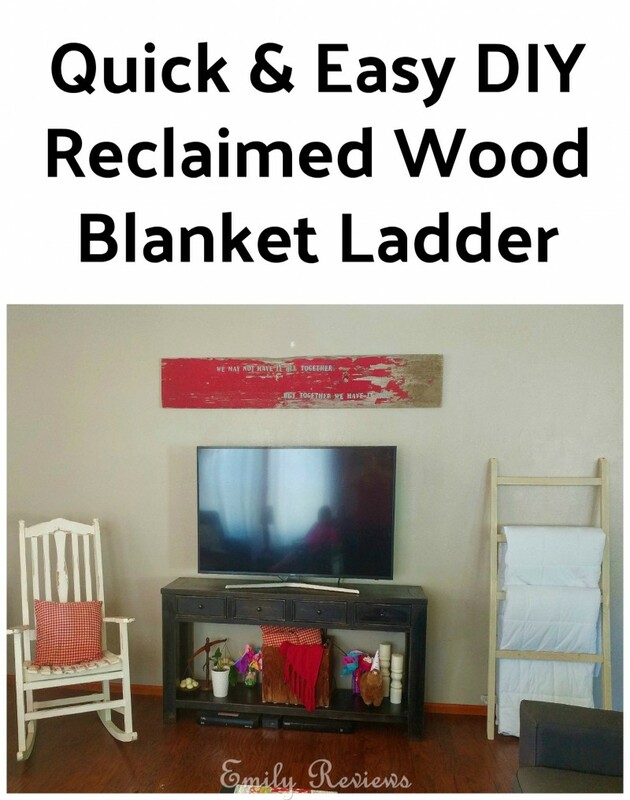 I built my own blanket ladder using reclaimed wood. I used 1x1s because that is what I had. If you have 1x2s or pallet boards, those would work too. This project took me less than thirty minutes and part of that time was used to solve an issue my kids were having. Lol. Good luck! This is an easy and fun DIY project. PS- This wall is going to get shiplap and new decor in the fall. Stay tuned for that DIY post! That is so cute. It looks like something I could do. Thank you for the article and pictures. What a cute idea, I have never seen a blanket ladder before! Thank you so much for sharing how to make one, this is definitely a project that I could handle. 🙂 It looks great in your living room too! 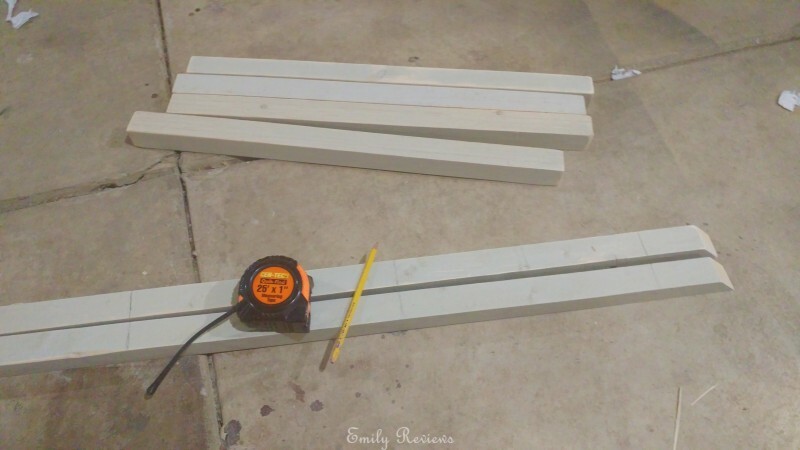 This looks like a fun and easy project. I like the look of the natural wood a lot. I could almost see putting ‘hinges’ on the top and making two sides of this if you had quilts to display or super heavy blankets. This would work too for towels so they wouldnt have to ask or search. I love this idea!! And what a quick and easy project! Thanks for the idea and plans for my next craft night!